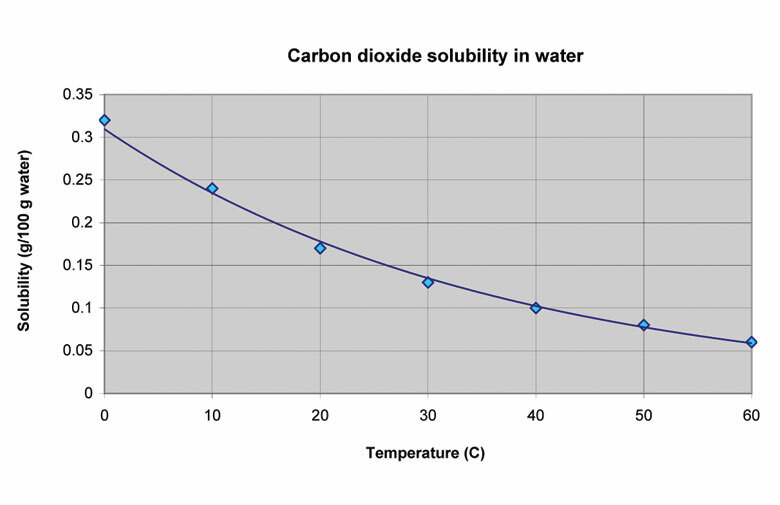 What Makes CO2 Soluble in H2O? You hear a satisfying sizzle and see fizz rise to the top of a bottle when you open a carbonated beverage. 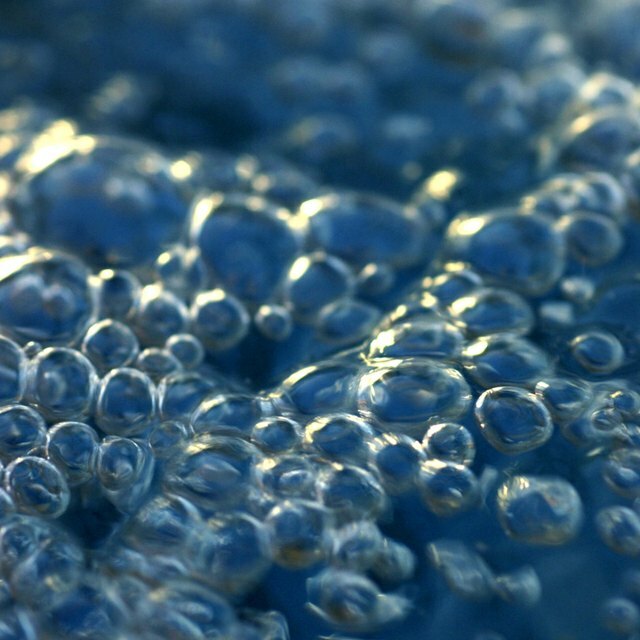 The bubbles creating that effect are molecules of carbon dioxide gas dissolved in water. It might be hard to imagine, but CO2 is soluble in water, as water surrounds carbon dioxide molecules and acts as a cage around them. One reason a gas like carbon dioxide dissolves in water is its charge. CO2 is made up of one carbon atom and two oxygen atoms. The atoms share electrons, but they don’t share those electrons evenly -- the oxygen ends of a CO2 molecule have a slight negative charge. Water molecules are attracted to these polar areas, allowing CO2 to dissolve in water. Carbon dioxide molecules must first pass the air and water barrier to dissolve in water. Once CO2 crosses the water’s surface, the molecules gain a shell of water molecules and transfer from carbon dioxide gas, or CO2(g), to carbon dioxide in an aqueous solution, or CO2(aq). This process is very slow. Not all CO2 molecules remain dissolved in water -- a fraction of them react with water to form carbonic acid, or H2CO3. This reaction is also very slow. Equilibrium is established between CO2, H2O and H2CO3. Carbonic acid is weak and can dissociate to bicarbonate or carbonate; hydrogen is produced from these reactions, which gives carbonated water a slightly acidic pH. 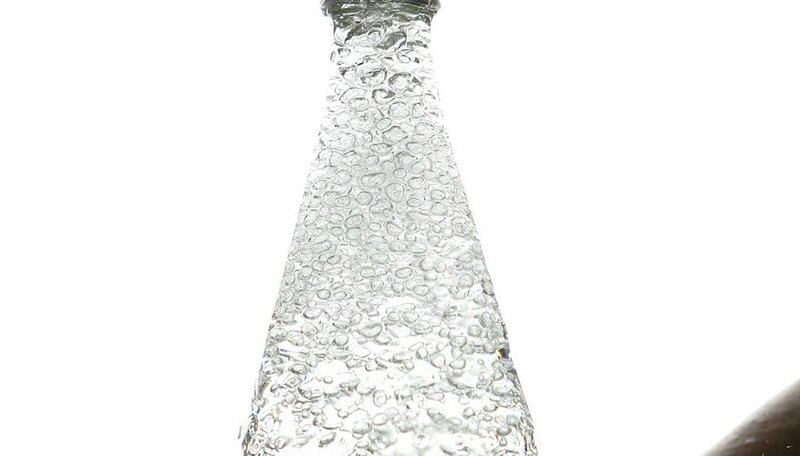 When you open a bottle of soda or sparkling water, you notice tiny bubbles form and rise to the top of the liquid. When factories produce carbonated beverages, they add CO2 to water with high pressure to make more of the CO2 gas dissolve than would naturally. Carbon dioxide is typically added to cold water because its solubility in water decreases as temperature rises. You might notice a soda go “flat” or lose its carbonation. Because the attraction between water and carbon dioxide is not as strong as between water and sugar, for instance, CO2 molecules are released from the solution. Frostburg State University: How Do Nonpolar Molecules Like CO2 and O2 Dissolve in Water? American Chemical Society: Can Gases Dissolve in Water? Batema, Cara. " What Makes CO2 Soluble in H2O?" Sciencing, https://sciencing.com/co2-soluble-h2o-18452.html. 13 March 2018.